In a recent review, we evaluated the AS3102T with a dual-core Intel Celeron CPU (N3050 Braswell). The AS31 line addresses users without high demands, while the fresh AS32 family is for more demanding home users in need of stronger hardware, which will not only speed up the regular functions of a NAS, but will allow it to more readily cope with high bitrate and resolution multimedia content. 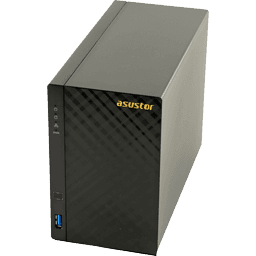 Like most Asustor NAS servers, the AS3202T has an HDMI port, which will prove useful in a number of applications since an HDMI port can also be used to locally access the operating system of a NAS with nothing but an additional keyboard and/or a mouse. Every NAS should come with an HDMI port, especially since most SoCs support one without the need of additional expensive hardware. The combination of an Intel Celeron J3160 processor and 2 GB of RAM looks promising for home use. However, we will figure out whether such is truly the case in our lengthy test sessions, and only after all test results are available will we draw a detailed, definite conclusion about the AS3202T's performance, which we will compare to competing offerings in this highly popular category (mid-range 2-bay NAS servers).